LIMERICK PA – Former Penn State cornerback, Adam Taliaferro who was paralyzed during a game and defied the odds to walk again, was named the featured speaker at the 2014 edition of Exelon Nuclear’s Limerick Generating Station’s annual United Way campaign on Friday Sept. 5. The event also featured an employee car and motorcycle show. During the event, the station also presented a $10,000 donation to Lower Pottsgrove Township’s Emergency Services Department, and a $5,000 donation to the Pottstown Senior Center. 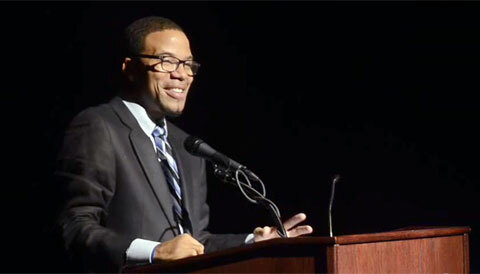 Photo shows former Penn State football player Adam Taliaferro in 2011 at WellSpan Health’s ‘Journey of Courage’ speaker series speaking about his injury and recovery. Though, playing football is no longer in Adam’s future, his inspirational tale of recovery has been followed in Happy Valley as well as the nation, leading authors Scott Brown and Sam Carchidi to chronicle his remarkable story in their 2001 book Miracle in the Making. Taliaferro graduated from Penn State, on time, in 2005. In his remaining time at school, he received the Maxwell Football Club”s Spirit. Adam has also started his own foundation named the Adam Taliaferro Foundation that provides financial assistance to individuals affected by spinal cord injuries. Through his foundation, Adam continues to provide hope for so many people who feel that there is no reason to hope at all. Playing Field Promotions is a booking agent for motivational sports speakers and celebrities. If you would like to book Adam Taliaferro for a speaking engagement or personal appearance, contact Adam Taliaferro’s booking agent for appearance & speaker fees at 1.800.966.1380.